Many consumers know that “organic” fruits and vegetables means the food has been grown without the use of pesticides and chemicals. But the word has deeper significance for the six members of Glorious Organics, in the Fraser Valley, east of Vancouver. For starters, the farmers at this co-op in the community of Aldergrove have been using organic techniques since the early 1980s. That is about a decade before the provincial government created regulations. They actually helped to write the organic certification program that is now used across all of B.C. They also became a founding member of B.C. Eco Seed, a co-operative that distributes ecological and organic seeds grown in B.C. And they are now working on new initiatives to help small-scale farmers cope with climate change. Today, Glorious Organics grows more than 200 crops on 20 acres of land at Fraser Common Farm. There are a dozen people who live in co-op housing on the property, and many seasonal workers who help out each year. The B.C. Tree Fruits Co-op in the Okanagan has invested in a new multi-million dollar state-of-the-art production line that’s said to revolutionize the fruit sorting process. A device called an optical sorter uses cameras to automatically sort and grade fruit by size, colour and defect. The co-op runs anywhere from 600 to 1800 pieces of fruit per minute underneath the camera box. Photographs are taken of each piece of fruit and pictures are displayed on a computer screen that highlights the imperfections. It allows the co-op to pick up things such as bruises. The price-tag for this high tech tool? More than $3 million. “I hope that our growers see what we are doing, that we are reinvesting into facilities like this with a state-of-the art camera that nobody else in the valley has,” said Chris Pollock, marketing manager with the B.C. Tree Fruits Co-op. He said it will give south Okanagan growers a competitive advantage over other fruit growing regions like Washington State. 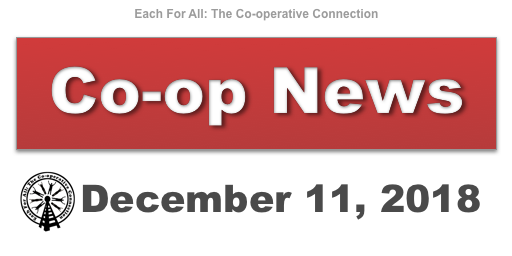 The Terrington Co-op is the only major grocery store still open in the town of Happy Valley-Goose Bay, Newfoundland after a fire recently damaged the Northmart store in the town. By the time Bob Shiwak, vice-president of the Terrington Co-op grocery store, arrived at the store on a recent morning, it was already packed. “A guy’s just going by, he’s got eight chickens in his basket,” he told CBC News from the store. As he spoke from inside the store, he said that food, especially meat, was flying off the shelves. “They can’t put it on the shelves fast enough,” he said. The co-op was expecting a delivery of groceries, to help keep up with the demand in the community.